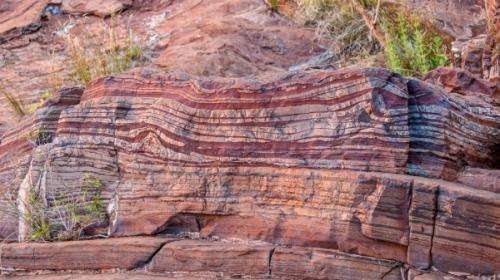 A UWA geologist has proposed a hypothesis which threatens to overturn conventional notions of the way Banded Ironstone Formations (BIF) first evolved. BIF is a sedimentary rock with stripes of iron and silica which is well known to geologists and rock collectors. While it is generally accepted that BIF formed when dissolved iron oxidised and settled to the bottoms of early seas, geologist Desmond Lascelles says this would have been impossible as iron is only soluble in acid. "Ferrous iron is not soluble in sea water," he says. "It only occurs as colloidal ferric iron or ferrous iron in sea water which precipitates out, but you can't end up with sufficient iron in solution to form a banded iron formation." As none of these compounds are water soluble, Dr Lascelles says the ocean cannot form a large reservoir of iron. He says silica, which forms the lighter bands in BIF, is similarly insoluble. While it initially mixes with water it precipitates out as it ages so large quantities never occur in solution. Instead, he says, the iron and silica compounds came from hydrothermal vents on the ocean floor known as "black smokers". The "smoke" is the precipitated iron oxides and iron silicates that end up as a mound around the vent. Dr Lascelles says water currents redistribute these mounds and the particles settle elsewhere as layers of mud that harden to become banded ironstone. Known BIF deposits are at least 1.8 billion years old, which is 600 million years after the "great oxidation event" when green plants first oxygenated the atmosphere and ocean. Younger BIF has not been found, supporting the conventional notion that newly-oxygenated seas quickly lost their reservoir of dissolved iron, which literally rusted forming most of the world's BIF within a relatively short period. However, Dr Lascelles says the apparent increase in the amount of BIF in the Paleoproterozoic era (2,500 to 1,600 million years ago) had nothing to do with oxygen in the atmosphere. Instead he attributes it to the introduction of plate tectonics and the movement of continents, after stable continents first formed. Dr Lascelles says younger BIF forms on the ocean floor but the tectonic plates supporting it are then subducted under the continents. According to his model, banded ironstone has been forming throughout history and new deposits may still be occurring, under suitable conditions, from hydrothermal vents deep beneath the ocean. He appears to assume - without justification - that the chemistry of seawater, and especially its pH, is similar now to what it was in the distant past. However, the chemistry of the early atmosphere likely contained large amounts of CO2 and SO2, both of which form acids when dissolved in water. Moreover, this theory does not appear to be connected to a paper. Was he overheard in some Australian pub? Shoddy journalism here. The paper is in Transactions of the Institutions of Mining and Metallurgy, Section B: Applied Earth Science, Volume 122, Issue 4, December 2014, Pages 230-241, however Dr Lascelles has published similar ideas before, he works in BIFs and is critical of the standard model for them.